It’s 95 degrees Fahrenheit and stunningly sunny as I wind through every little alley and souk in Essaouira’s medina. I’m getting desperate to find a new place to sleep for the next two nights so Todd can recover from the food poisoning that’s turned him to mush. The place where we stayed last night, Hotel Majestic, is dingy, unpleasant, and their bordering-on-gross bathrooms – no more than 10 feet from any room’s door – are echo chambers for every noise that happens within. And Todd’s making a lot of noise. I’m starting to feel a little noisy myself. Most hotels are dirtier than the Majestic, complet (full), or are more than Dh 500, which is a steep $70 US a night. I’m in the smallest alley yet. I pass by a tiny homeless woman every ten feet. 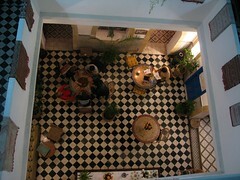 I bounce into the Riad Sidi Magdoul. I’m running out of steam. I walk into a tall central atrium, surrounded by three floors of balcony. It’s a riad. Oh, god, I can’t afford a riad. Since they’re all gussied up with Moroccan details, mosaics, and plants , they’re at the top end of the price range. Since it’s not the most expensive price I’ve been quoted, I check out the room. It’s quiet. And best of all it has a clean en suite bathroom. The only problem is it’s Dh 400. Todd and I are traveling for the next year and already our daily average would have us in the All-Star Game. This I understand. 300 I can do. I say “Yes, thank you! I’ll be back in a few minutes! !” and run off to get Todd. Once back at the riad, both Todd and I sleep and heal, in private, for the next 24 hours straight. Our hosts even offered us some of their fragrant family tajine, but unfortunately in our unstable internal state, food was a kindness we could not accept. Of course I emailed you “I hope everything is well” just before I view this. I hope Todd feels better sheesh it got rough quick huh? :\ Well keep rockin’ everything will get better. Nice pics by the way.